She's Fantastic: Masters of the Universe Classics - DESPARA! Masters of the Universe Classics - DESPARA! 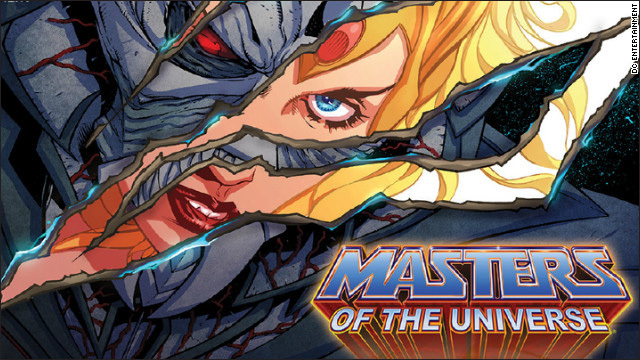 I really enjoy all the He-Man comics that have been coming out over the past few years. The Eternity War series was especially good. But as much as I enjoy them, I'm a purist at heart and I always prefer the original cartoons as far as design and storylines go. However, one thing I always thought was silly in the original She-Ra animation was the design of Force Captain Adora. 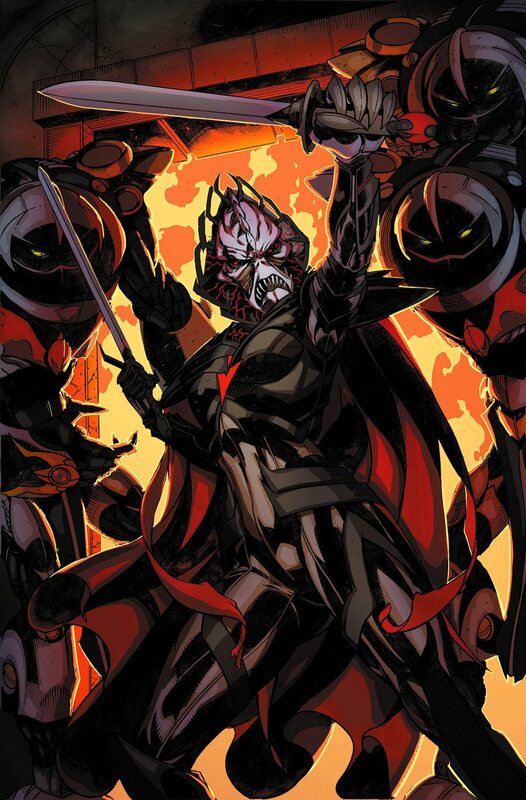 For someone living as the 'daughter' of her kidnapper Hordak and acting as a leader for a squad of Horde Troopers, she sure did look pretty and nice. The DC Masters of the Universe comics changed this up in a 2012 digital issue and portrayed her as Despara, a ruthless military leader with a frightening mask to tie appearance her to Hordak. I loved this revisionist twist. This figure is the subscription exclusive for the Collector's Choice sub and is one of the last MOTUC females we'll see before production switches to Super7 in 2017. It should be interesting to what the future holds for this line. Let's check out Despara below! Okay. I wanted to post the picture above before I focus on the myriad of paint issues below. I got two Despara figures and they were both sloppy as hell. I read a lot of online comments confirming these issues were pretty universal. Here are the unmasked heads. They both have wonky eyes, random flecks of yellow and black scattered around, and a really messed up mouth on the left with white paints smeared all over. The Horde heads also had some random flecks of paint, really sloppy tooth paint bleeding onto the lips, and weird spiky things around the edge are misshapen from the packaging. The masking of black paint is sloppy all over, but it is especially apparent on her thighs. 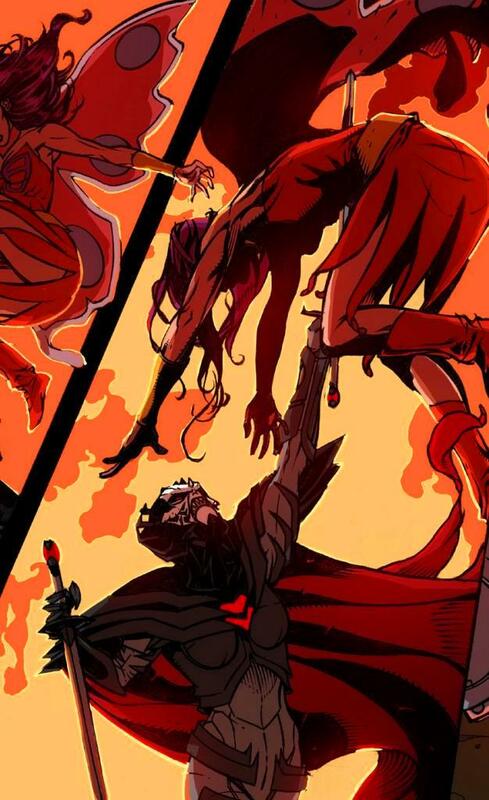 The red triangle on the middle of her cape piece looks globby and cheap. So I fixed up one of the heads as best I could. I basically used a magic eraser to scrub off the extra spots and added some eyeliner and a little black around her irises. She looks happier now - though that totally wasn't my intent. Despara comes with a Cape, and Alternate Head, a Staff, and Two Swords. Here is the amazing cover of the digital comic that first introduced us to Despara. 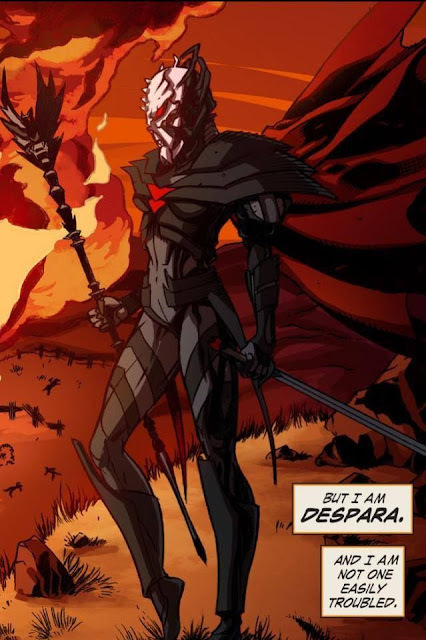 Despara was no joke. Here she is impaling Flutterina. Here are my two Desparas side-by-side. I'm going to display them this way. With two of her many Horde captains, Catra and Scorpia. Really nice work cleaning up that head!